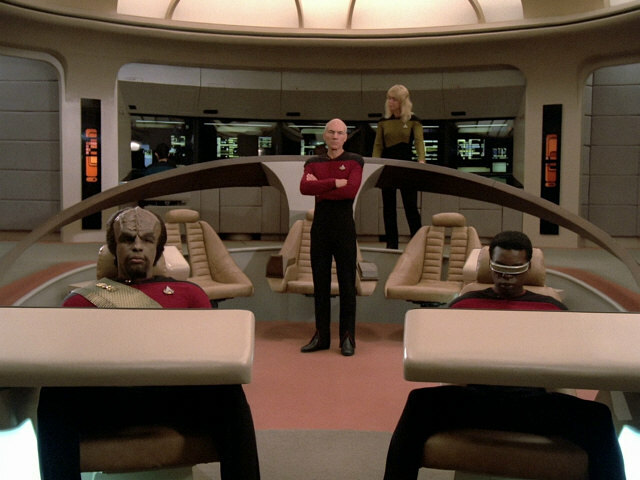 The whole first season of Star Trek: The Next Generation (TNG) was reconstructed for the Blu-ray set using the original 35mm negatives that were newly scanned with 1080p HDTV resolution. Only "We'll Always Have Paris" includes a tiny amount (2 seconds) of upconverted footage according to the disc menu. Since I browsed quickly through much of the episode, I didn't spot it. The aspect ratio of the remastered (TNG-R) episodes is 4:3 as in the original SD release. I am glad that CBS Digital didn't go for a wider format, because that would have meant cutting off elements at the top and/or the bottom of the filmed frame, and still in some takes the frame may have been too wide and could have revealed set borders, sound or lighting equipment. Widening the whole frame as was done for the re-used TNG scenes in ENT: "These Are The Voyages" was no serious option for the whole series either. I'm new to the Blu-ray world, and I actually bought a player just to view TNG-R. It took me a couple of tries to find out an image setting on our LCD TV that would include just the right amount of noise reduction to remove all the annoying white pixels and leave a decent graininess while not blurring the image too much. After that adjustment the image quality is superb, with little noise even in the dark scenes. I noticed a few occurrences of compression artifactsper episode, which I think is absolutely tolerable (well, we have digital satellite TV and perhaps we have gotten used to it too much already). Comparing screen caps that we took from the old DVD with stills from the Blu-rays, we can see that the resolution has doubled not just nominally (due to the 1080 lines of the HDTV standard) but also in our perception. Moreover, the contrast of the Blu-ray scenes is much better, especially in overall rather dark scenes and in effect shots. 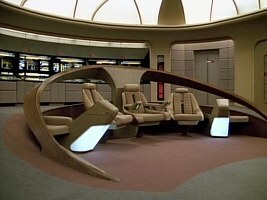 What I find even more remarkable than the increased resolution is the new color fidelity of TNG-R. The old TV episodes used to have generally pale colors with a purplish hue. The bridge appeared to be salmon on TV when it was in fact predominantly ochre as the remastered version reveals. 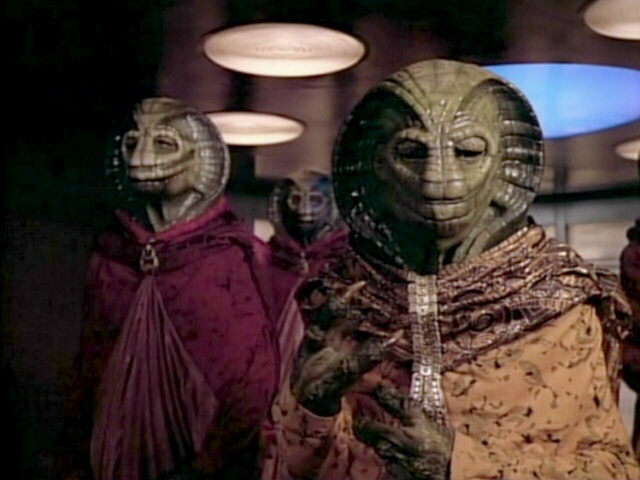 TNG-R shows that aliens such as the Selay from "Lonely Among Us" are in fact far more colorful than we remember them. And even the gray sack that Michelle Phillips is wearing in "We'll Always Have Paris" comes across as a bit more attractive in its original light blue color in TNG-R. The newly mixed 7.1 sound of the remastered episodes is quite good as far as I can tell by turning up our measly two TV speakers. I noticed an inexplicable tinny and noisy sound only in "Haven", unfortunately throughout the whole episode. I have no idea what went wrong with this one episode, and whether it's perhaps just our sound system. I don't think I have to introduce Star Trek: The Next Generation (TNG) in any fashion. It is widely recognized as one of the best science fiction series, and arguably the most successful sequel series of any genre ever made. 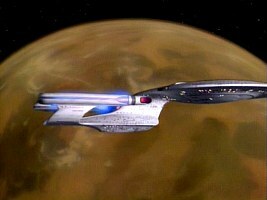 It outperforms its predecessor, The Original Series (TOS), on a couple of accounts. 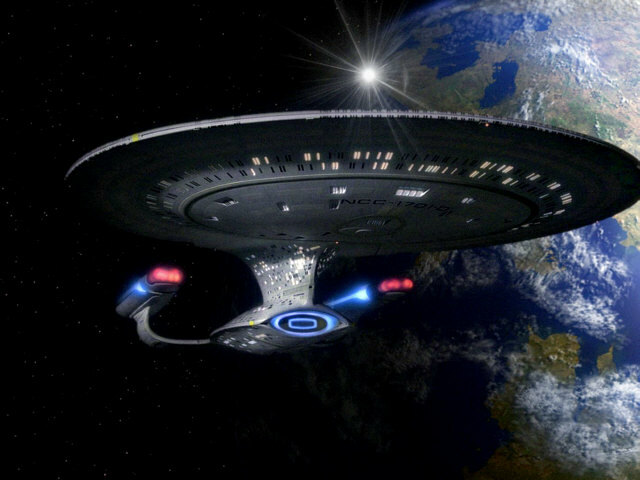 Characters such as Picard or Data have become almost as iconic as Kirk or Spock. That being said, overall the first season of TNG isn't exactly the most compelling and the most original one of the series. 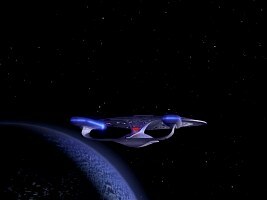 Several of the first-season episodes try hard to put a fresh spin on old TOS stories instead of exploring the new possibilities of the 24th century. The introduction of the Ferengi as new villains fails, and they end up rather as comic relief. 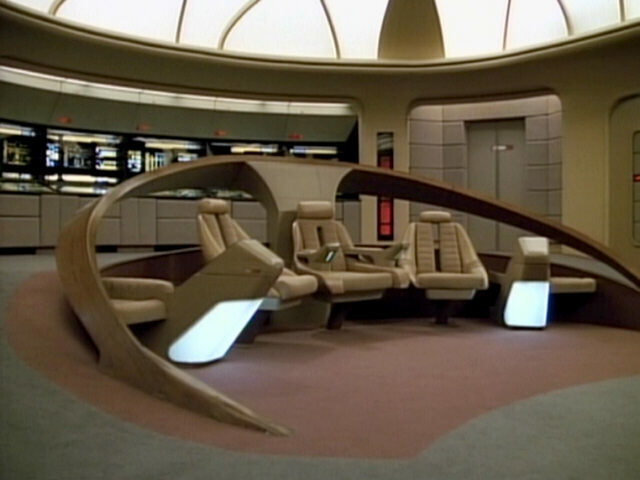 On the other hand the holodeck, which appears in the two arguably best episodes of the season, "The Big Goodbye" and "11001001", is successfully established as a defining technology of the 24th century and a new means of storytelling. For much more on the stories of the first season, I recommend my episode reviews. After checking out all remastered season 1 episodes at least in "fast forward" mode, I am pleased about how little was altered. 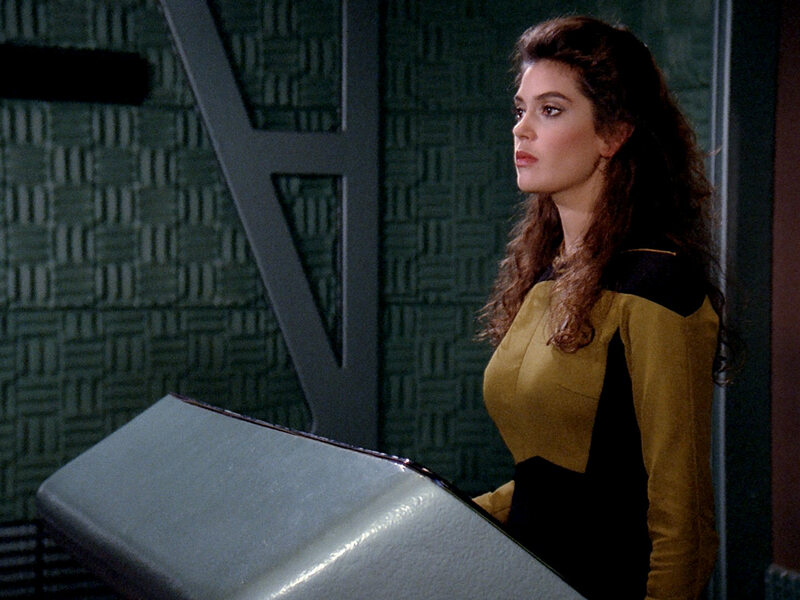 TNG is my favorite TV series (not just of Star Trek), and I would have had a hard time accepting changes relevant to the course of the story, even in the rather unexciting first season. 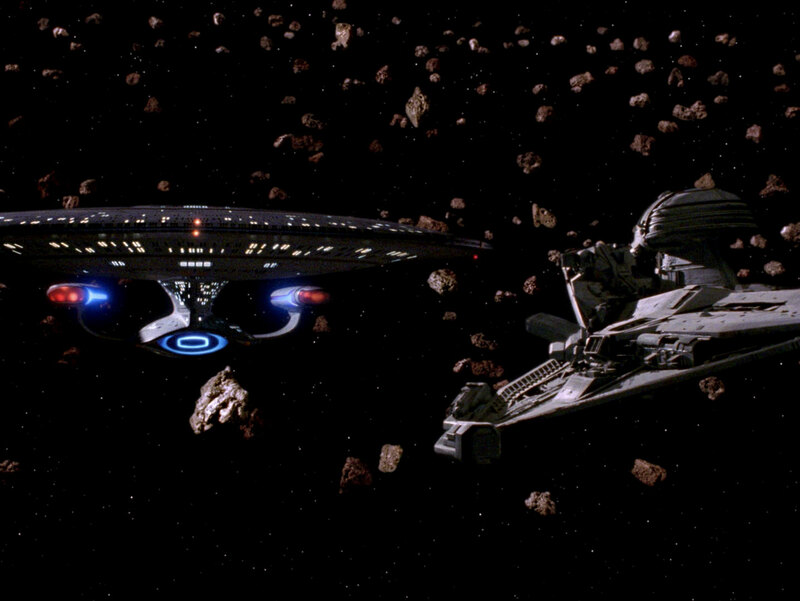 Nearly all scenes involving starships were reassembled from the originally filmed single passes. All new light effects closely reproduce the look of the original. The arguably most obvious changes are those to the planets. 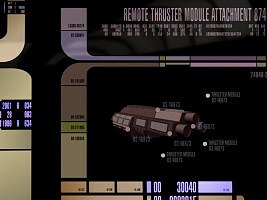 As far as I can tell, only Deneb IV in "Encounter at Farpoint" as well as Haven in "Haven" and its reuse as Bynaus in "11001001" are still represented by the old models. All other planets were digitally rebuilt, obviously because the original material was not good enough for HD. 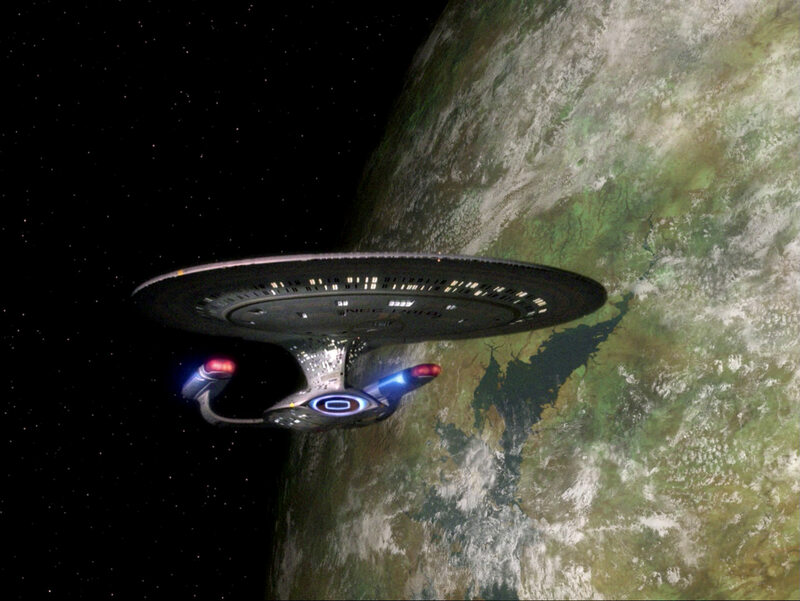 I appreciate that all new planets closely resemble the old ones, in their color as well as in the shapes of the continents, something I may have wished for a couple of the reimagined TOS planets too. Some bloopers were removed for TNG-R. This was occasionally done actively such as in the case of a flower pot in "The Arsenal of Freedom", which was covered by a digitally inserted piece of rock. Other imperfections, such as a visible set border in "Hide and Q", are gone because the scan area was shifted or resized. On the other hand, perhaps a little bit more could have been done to remove all bloopers. 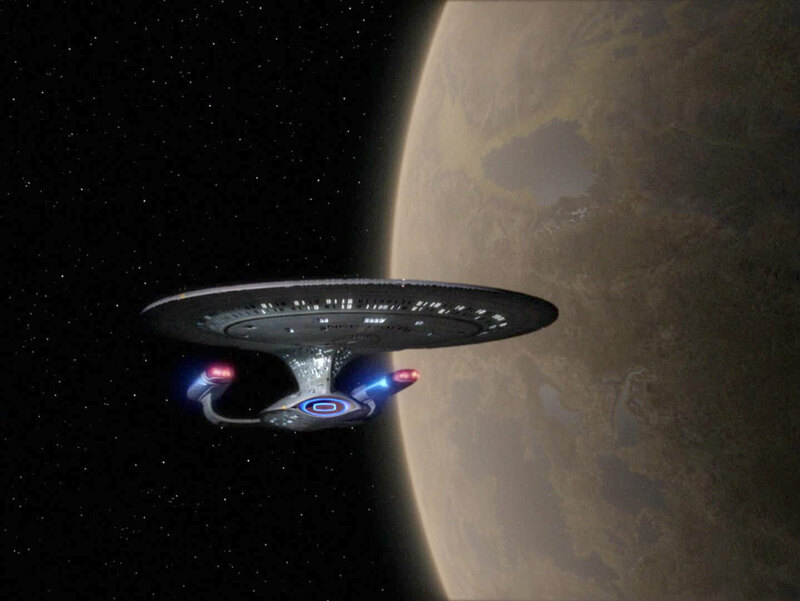 For instance, a few episodes still use reversed shots of the Enterprise on which the mirror writing is now more recognizable than ever. But speaking of writing, I find it noteworthy that Clare Raymond's family tree in "The Neutral Zone" was completely reworked and now reads far more realistic. All other displays in the first season remain unchanged, with one small exception in "The Naked Now" where the original Enterprise side view was inserted to fit with the dialogue, as Data is reviewing the records of the "The Naked Time" incident. The Blu-ray set comes with two new special features. "Energized: Taking the Next Generation to the Next Level", on the first disc, shows how the HD version of Star Trek TNG was created. 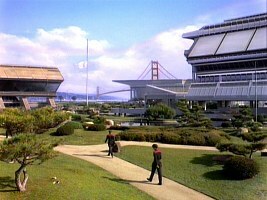 It has interviews with the Okudas and several other members of the team that created TNG-R at CBS Digital. Perhaps most importantly, the documentary demonstrates why 4:3 was chosen as the aspect ratio, rather than 16:9. The latter may have exposed lighting equipment and other stuff outside the safe action area. There is some insight into the painstaking process of recomposing effect shots with starships that consist of several separate passes. We get an impression of how Max Gabl created new planets such as Minos from "The Arsenal of Freedom" and how Niel Wray reconstructed the Crystalline Entity from "Datalore". 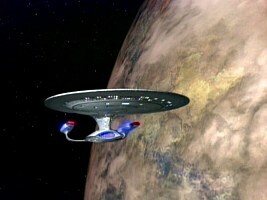 "Stardate Revisited", on the last disc of the set, is a three-part documentary about the show's inception 25 years ago. It features new interviews with the complete season 1 cast, as well as with notable people behind the scenes, such as Rick Berman, D.C. Fontana, Andrew Probert or Michael Westmore. 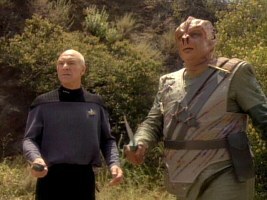 There is Patrick Stewart, who says that he was convinced the series would not work, so he went and signed up for half a year or for as long as it would last. We see several camera test shots (all in HD) with not-yet-final make-up, such as Data with a pink or a battleship gray skin color. The secret of Counselor Troi's hair is uncovered (which is Marina Sirtis's real hair only in the pilot, according to the actress). We can witness how the "psychedelic" light effect of the engines of the Tarellian ship from "Haven" was created using a spinning color wheel in front of a spotlight. And perhaps most curiously, the people inside the Enterprise-D observation lounge in the main title are revealed to be a simple pencil animation. There are also some rather critical remarks about the role of Gene Roddenberry, who used to rewrite scripts in a matter of minutes and without consultation and who was generally hard to work with. Something I miss on the Blu-ray set is any form of audio or textual commentaries on the episodes. The Blu-ray sets include the old DVD features that pale in comparison to the new ones, technically speaking. Moreover, these 4:3 parts are stretched to 16:9 by default. Either my player didn't get this right or it should be corrected in future releases. So is it worth buying? 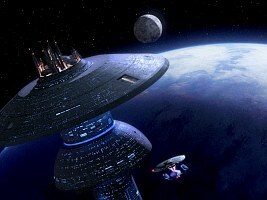 Definitely yes, for TNG fans who will experience the best science fiction series ever in a so far unimaginable quality. 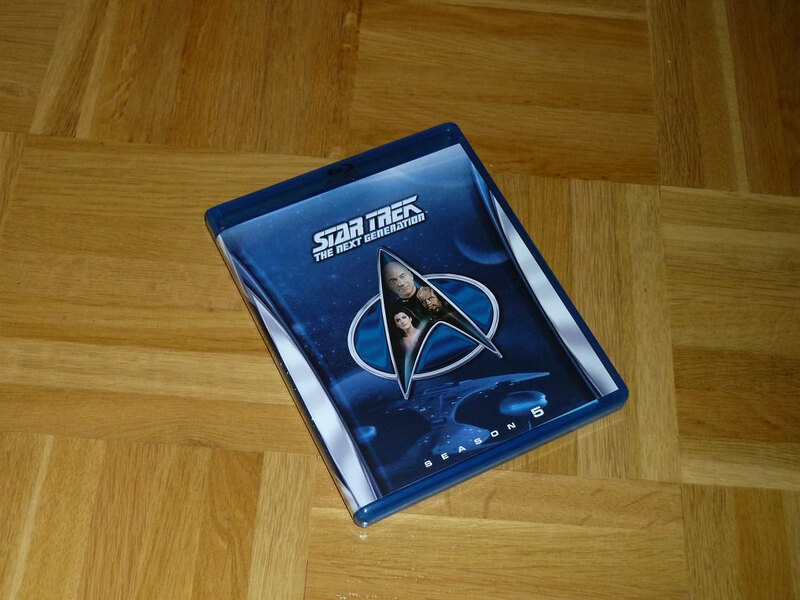 Yes, for those who like Star Trek, who always wanted to buy a Blu-ray player and who now have the perfect incentive. Rather yes, for general science fiction fans who may or may not have a Blu-ray player and who may or may not have TNG already on DVD or VHS. Perhaps, for a next generation of fans who may come to appreciate their parents' favorite show if it comes in HD and brilliant colors. Rather no, for those who never cared for Star Trek anyway. The second season of Star Trek: The Next Generation (TNG) was not remastered by the established team at CBS Digital but by HTV illuminate. Apparently the two teams were working in parallel to allow a tighter release schedule of the Blu-ray boxes. 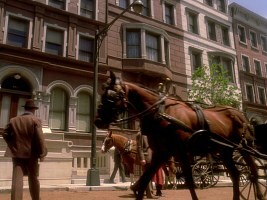 It is also noteworthy that the second season was shot with a different film stock than the first season. 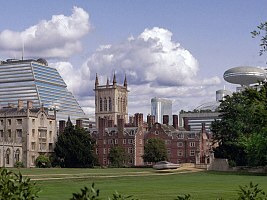 The second season film is commonly described as being more matte. I think this shows a bit in bright scenes, such as on the bridge, in which the first season in HD is somewhat more brilliant and with finer graininess than the second one under comparable conditions. Overall, however, a quality difference between the seasons is hardly visible after the HD transfer. The biggest surprise about season 2 in HD is that the aspect ratio is not exactly 4:3, which would give us 1440 pixels per line at 1080 lines as it was the case with season 1. The frames of season 2 are 16 pixels wider. While the difference to season 1 is hardly visible (except to people such as me who use scripts to process screen caps) and we might welcome the extra resolution, I would have expected more consistency in the basic transfer process. There are some instances of incorrectly framed shots in season 2 (leaving black borders on the left or the right), most notably in "The Schizoid Man" and "Peak Performance". In a couple of shots the image proportions are not correct, which is particularly visible in "Loud as a Whisper" and "The Icarus Factor", where the Enterprise is clearly too narrow. Season 2 had a better color reproduction than the overly purplish season 1 already in the original SD release, which may or may not have to do with the different film stock. Maybe it was just a matter of an improved transfer procedure. Anyway, it is pleasant to see that in the Blu-ray release the two seasons are finally equalized in terms of color fidelity. At times, however, it seems that the color intensity was reduced on the season 2 Blu-rays compared to the SD release or shots turn out more bluish than I would have expected them to be. As already mentioned in my season 1 review, owing to my limited equipment I can't really judge the quality of the remastered sound. Anyway, I couldn't find anything wrong with the sound so far. I think most fans agree with me that TNG's season 2 was an improvement over season 1, despite the departure of Dr. Crusher who got replaced by the less popular Dr. Pulaski. 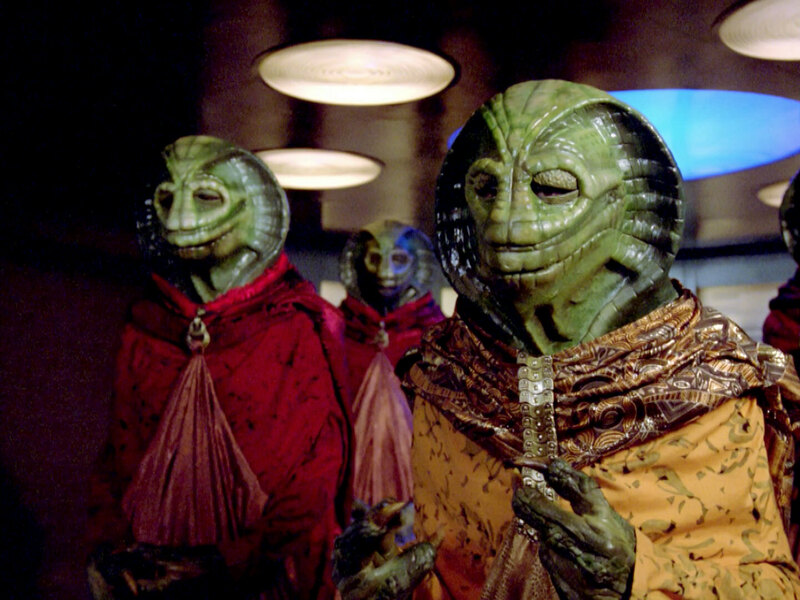 While TNG initially rehashed too many TOS stories and failed to introduce the Ferengi as regular opponents, the second season most notably came up with the Borg and revived the Romulans, thereby establishing the concept of multi-episode arcs in the franchise. 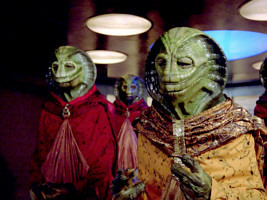 The writers moved the characters into the focus of interest again, rather than only using them for a generic "political intrigue" or "strange phenomenon" story. The pivotal episodes of the second season, such as "A Matter of Honor", "The Measure of a Man", "Q Who" and "Peak Performance", with accordingly strong involvement of the crew, are fan favorites still today. We only have to forget that the season ended with a major stinker, the infamous clip show "Shades of Gray". For a much more detailed analysis of the stories of the second season, I recommend my episode reviews. As already in season 1, nothing of importance was visually altered. 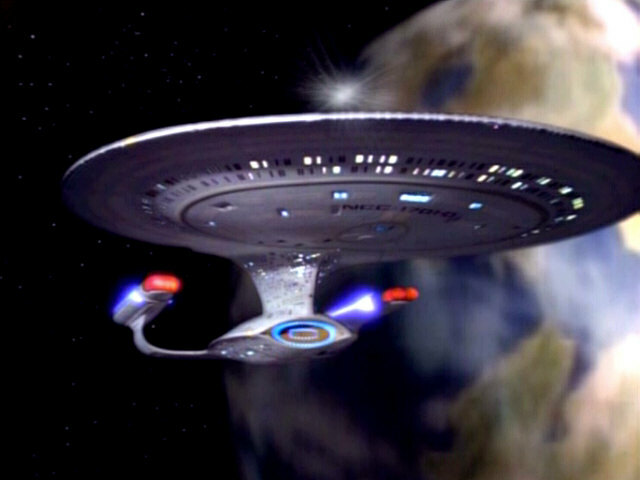 Light effects such as of phasers or energy fields were recreated to be as close to the original as possible. 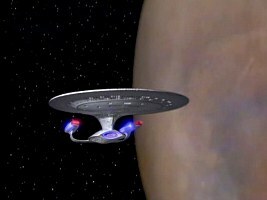 With a few exceptions, all miniature shots of starships could be recomposited for the HD release, even those of the tiny probes in "Where Silence Has Lease" (whereas the Enterprise is computer generated in the TNG-R shots with the probes). We can see more newly created CG versions of ships in "The Outrageous Okona" (towing of the Erstwhile), "A Matter of Honor" (close-ups of the BoP) and "Peak Performance" (one aft shot of the Hathaway). Season 2 also reuses a number of planets, unlike it was in season 1 where nearly every planet was reconstructed from scratch. While some matte paintings are still the same or were only insignificantly changed, some new ones were recreated from scratch. 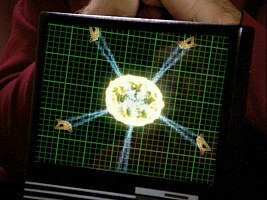 I especially like Wesley's holographic space sceneries that he uses to impress Salia in "The Dauphin", the surface of Iconia in "Contagion" and the interior of the Borg cube in "Q Who". Regarding the quality of the new visual effects, I think while they overall look just as good as in season 1, in some cases HTV's work does not quite live up to the very high standard established by CBS Digital. Several of the new planets are too blurry. 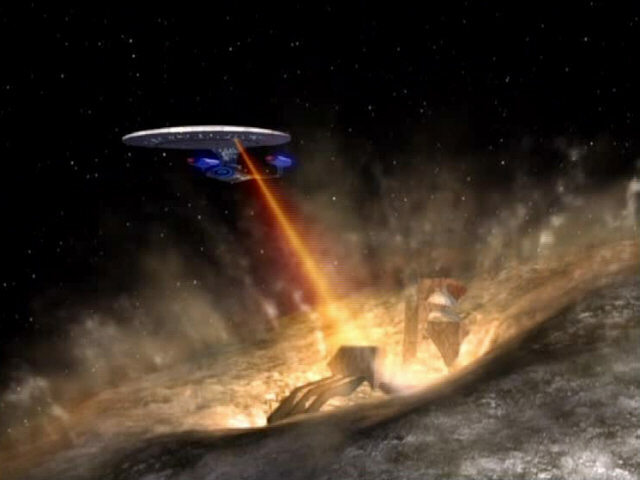 Some light effects are not quite consistent, such as a tractor beam that seems to stop ahead of its target. A few of the displays that had to be recreated are visibly different because HTV customarily used a new font. 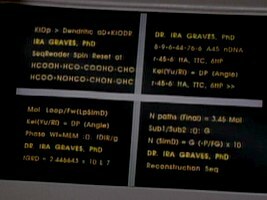 One of them, the medical data in "The Schizoid Man", additionally contains a couple of errors. Overall the team at HTV did just as good a job as CBS Digital in removing bloopers such as visible set borders or lighting equipment, which was most often a matter of simple reframing. The Blu-ray set includes several new special features. “Making it So: Continuing the Next Generation” tells how season 2 of the show came to life almost 25 years ago, with some interesting insight into technical details of the production. For instance, we learn that Dan Curry created the effect of the Borg tractor beam using a laser and a beer can. “Reunification: 25 Years After Star Trek: The Next Generation” is the long-awaited reunion of the main TNG cast. This feature is quite entertaining for the most part, and besides the usual anecdotes it gives us a good impression about how the actors came together 25 years ago and how they feel about it today - with no one looking back with remorse. The highlight of the Blu-ray set is arguably the extended version of "The Measure of a Man", including a couple of scenes that were cut from the original release and can be seen for the first time. In addition, the discs include 10 minutes of deleted scenes from “The Icarus Factor” and “Up the Long Ladder”. Audio commentaries are available on "Q Who" (with Dan Curry, Rob Bowman and Mike Okuda) and on "The Measure of a Man" (with Melinda Snodgrass, Denise Okuda and Mike Okuda). The Blu-ray sets also include all the old DVD features. I am glad that the two issues of the "Departmental Briefing" (from 2002) are still a part of the Blu-ray set because they profit from fresher memories of the cast and crew and still don't appear dated today. 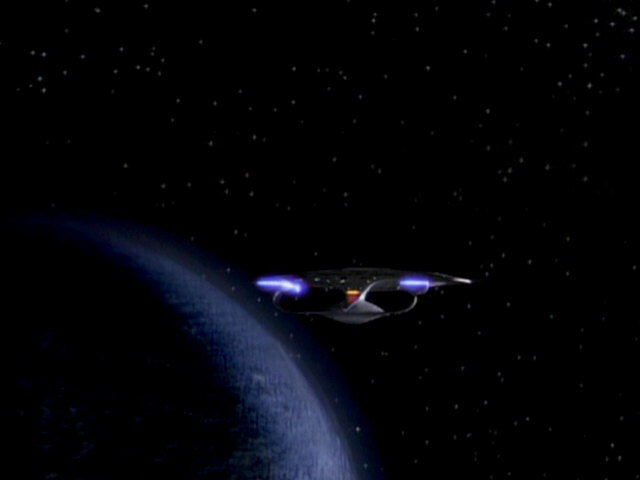 Some fans criticize HTV for doing a sloppy job with season 2, usually citing the blurry planets as the main reason. I agree that season 2 does not quite live up to the very high standard of season 1 on the technical side, with the false proportions of the Enterprise, the repeated incorrect framing and the errors on the display in "The Schizoid Man" being additional grievances. However, if I were to rate HTV's work, it would fall short at most a few percent of CBS Digital's. And the quality of stories as well as the extra features of the season 2 discs more than make up for a few shortcomings. Unlike the second season, the third one was remastered by the established team of CBS Digital again. It was apparently possible to locate the complete original film for the HD transfer, including the 13 seconds from "Sins of the Father" that were missing on the Blu-ray sampler. The third season was originally shot with yet another different film stock than the second season. The images of the season 3 HD episodes are a bit sharper than in season two, and with a fine grain that lets it appear a bit more vivid. Perhaps this is also because less noise reduction was applied in season 3. The frames of season 3 are 1438 pixels wide, which translates to an aspect ratio of almost exactly 4:3. More precisely it should have been 1440x1080 pixels, as in the first season. 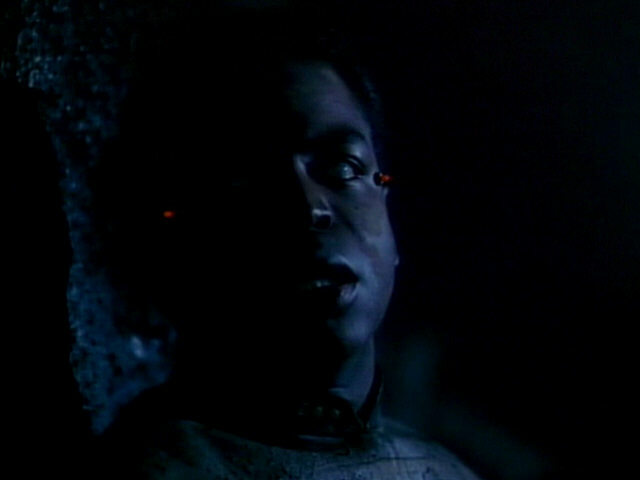 Not only the resolution but also the overall image contrast was greatly improved by the HD transfer, as can be seen especially in the dark scenes in episodes such as "The Enemy" or "Samaritan Snare" that were hardly recognizable in the DVD version. Speaking of dark scenes, while the remastered episodes of seasons 1 and 2 were mostly just as bright as the original ones, the remastered season 3 contains many scenes that are noticeably darker, in live action as well as in visual effect shots. As already in the remastered versions of the first and the second season, the improvement of the color fidelity is amazing. We can notice a considerable improvement in scenes that were shot on location, in sunlight, such as in "The Survivors", "Who Watches the Watchers" or "Ménage à Troi", which used to be quite dull in the original release and look stunningly realistic now. 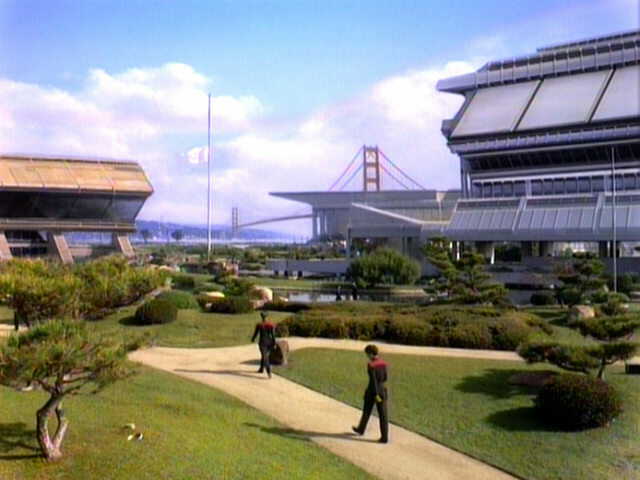 Furthermore, there used to be a color discrepancy between the original SD releases of the first three seasons, as can be seen particularly well in shots of the bridge that sometimes had a purplish hue in season 1, was consistently beige in season 2 and became less colorful in season 3. In HD the colors of the third season are much like in the two previous ones (although I still have the impression that the beige of the bridge walls is somewhat less intense). I found no problem with the sound quality (at least none that I would attribute to the Blu-ray discs, rather than to my player). Season 3 is commonly regarded as one of the best of the series. 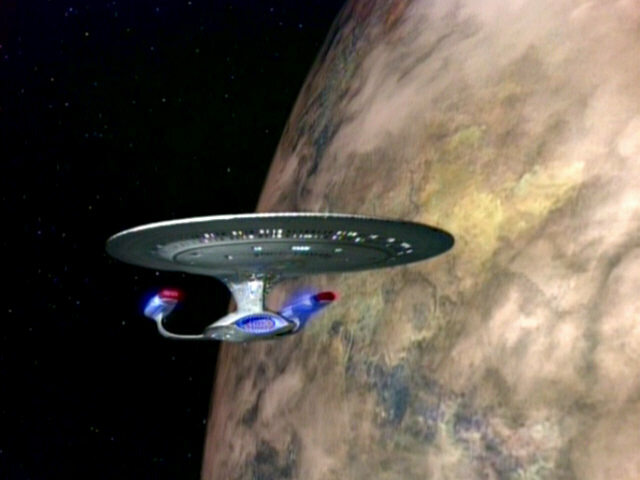 Although I think it is bettered by the three seasons that would follow, it includes some of the greatest episodes, such as most notably "Yesterday's Enterprise" and "Best of Both Worlds I" with its famous cliffhanger. Further highlights are "Booby Trap", "Sins of the Father" and "Sarek". Gates McFadden is back in her role as Dr. Crusher, replacing Dr. Pulaski who never gained a great popularity. 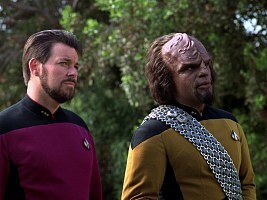 Overall the characters are still more personally involved than in season 2, culminating in Worf's discommendation by the Klingon High Council and Picard's assimilation by the Borg. A few episodes don't work so well, such as "The Survivors" or "The Bonding", but really bad ones are missing. I think the writing has reached a remarkably high standard in the third season, one that the rest of the series has to measure up to. For a much more detailed analysis of the stories of the third season, please go to my episode reviews. My only small beef with the content is that the set only includes the first part of "Best of Both Worlds". The second part will come with the Season 4 set, but I would have loved to get it as a feature-length episode. So I may have to buy the BoBW special Blu-ray as well. CBS Digital continued the policy of keeping the alterations to the original material to a necessary minimum. 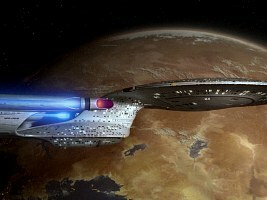 While all light effects such as of the transporter or of phasers were newly created, the starship and matte shots were recomposited from the original film. 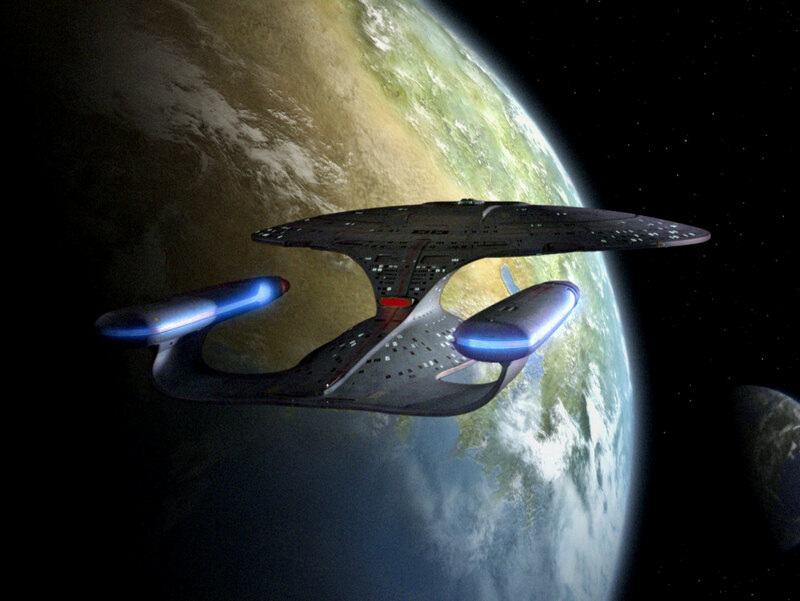 Almost all planets were recreated from scratch, however, including Vulcan ("Sarek") and Betazed ("Ménage à Troi"). The quality of the new planets, most if not all of which were done by Max Gabl, is clearly better than in season 2. They are highly detailed and appear with the sharpness that we expect from HD. The season 3 Blu-ray set comes with even more new special features than the two preceding sets. There are audio commentaries on "The Bonding", "Yesterday's Enterprise", "The Offspring" and "Sins of the Father". Also, the original footage of David Rappaport from "The Most Toys" was restored and a gag reel was composed in HD. Disc #6 includes no less than three newly produced documentaries: "Star Trek The Next Generation: Inside The Writer’s Room", "Resistance is Futile: Assimilating The Next Generation" and"A Tribute to Michael Piller". I am glad that CBS Digital worked on the recomposition of the third season, and I think the result is the best of TNG-R so far, both in terms of image quality and of mistake avoidance. This is the quality I expect from the remaining four Blu-ray disc sets too. After CBS had remastered the whole third season on their own, they handed over much of the work for the fourth season to the company Modern VideoFilm. Actually, only the second part of "The Best of Both Worlds" and the two-parter "Redemption I/II" were done by CBS Digital, in order to ensure visual consistency. Worries that the outsourcing of the remastering could have made the fourth season uneven are unwarranted, however. There are no visible differences between the work of CBS Digital and of Modern VideoFilm, and everything complies with the high standard established for season 3: no exaggerated noise reduction, no wrong proportions of the footage and no framing problems. The frames of season 4 are 1438 pixels wide, like those in season 3. 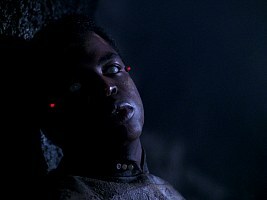 As already in season 3, the remastering did a great job improving especially the dark scenes, such as in the caves in "Legacy" or "Final Mission". However, in both episodes there are some shots that used to be moderately illuminated and were apparently darkened for the remastered release (this is more noticeable on the screen caps than when watching the episodes with a player, though). This may have been done to accomplish more visual continuity in "cave" scenes though. 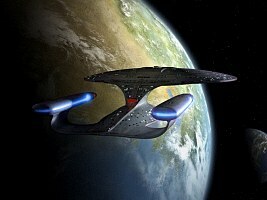 Furthermore, some shots of the Enterprise are too dark in my view. Only the first season of TNG suffered from an unpleasant pale salmon hue in its original TV version. There was not quite as much room (and need) for improvement of the colors in the following seasons. 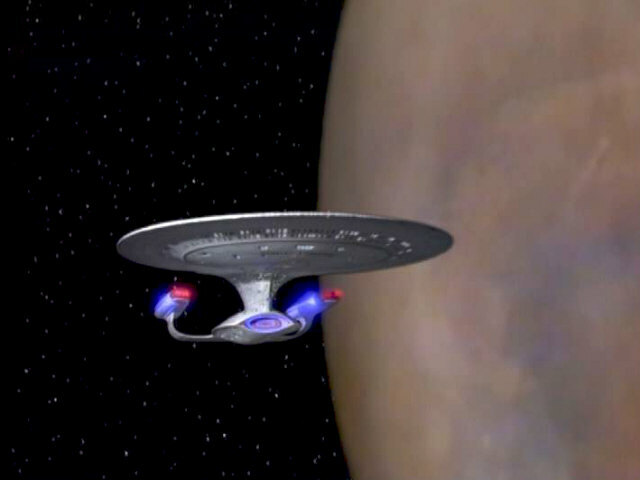 In the original version of season 4, however, many shots with bright lighting, even many filmed in the Enterprise sets, appear a bit more beige or yellowish than in seasons 2 and 3. And conversely, if I'm not mistaken, the remastered version of season 4 comes across still a bit less yellowish than what has been remastered for season 3, especially when comparing shots of the bridge. Overall, the color reproduction is stunning despite this possible small inequality. The episodes gain an almost cineastic semblance with the new and generally more intensive colors. I found no problem with the sound quality so far, once again with the explicit note that I don't have anything connected but simple TV speakers. Season 4 starts with an awesome cliffhanger and ends with one. But I think the two big two-parters are not typical of the season. I like to label season 4 as the "Season of the Family". 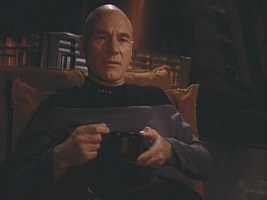 Many of the episodes are concerned with the family affairs of various crew members such as Picard, Data, Riker, Worf, O'Brien and even the deceased Tasha. Among all those episodes with personal involvement, a few really stand out, such as most notably "Reunion" (where Worf is faced with the death of K'Ehleyr and takes revenge) and "Future Imperfect" (where Riker gets acquainted with his future son although he turns out to a be fake). Well, and for those who always hated Wesley, his departure was probably a reason to rejoice. Overall, the tendency to involve the crew stronger shows that the show has matured and is not primarily about anomalies of the week or about unpleasant guests who hide a secret. It is a more daring season in terms of social commentary as well. 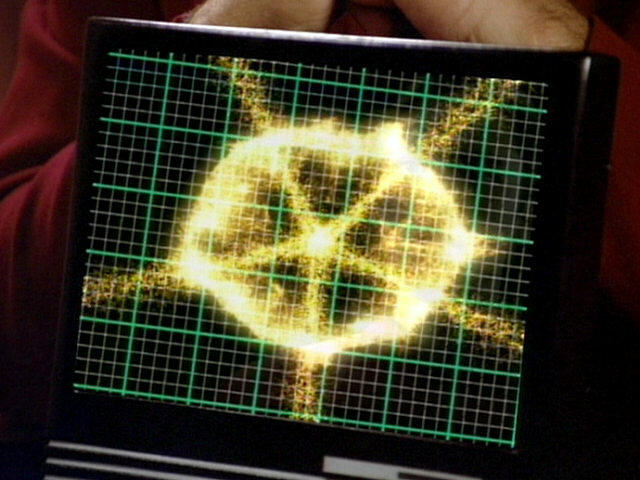 While "The Drumhead" shows the outgrowths of the system of the Federation itself, "First Contact", "Half a Life" and "The Host" call in to question how the Federation deals with other ways of life (although Beverly's involvement in the latter episode just doesn't work). Please go to my episode reviews for a more detailed analysis of the individual episodes. It appears that all new planets in season 4 were done by Max Gabl again. 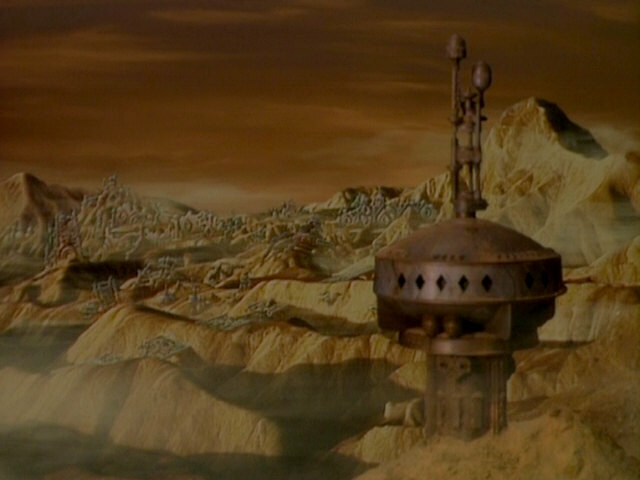 While all of them are a great improvement over the ones in the original episodes (which in most cases were re-uses anyway), a few them are simply stunning, such as Peliar Zel from "The Host". Among the visual effects in space, the "space whales" and the birth of "Junior" in "Galaxy's Child" stood out in the original release. 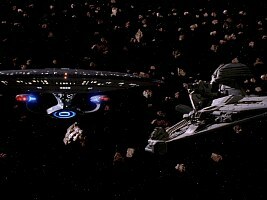 It was the most complex CG sequence of Star Trek at the time. In TNG-R, the reconstructed "space whales" only live up to the standard of the original, rather than to present-day CGI, and are a bit disappointing as such. 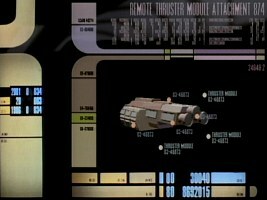 In season 4, it is particularly noteworthy that many LCARS screens were redone for TNG-R, especially if they contain animations. 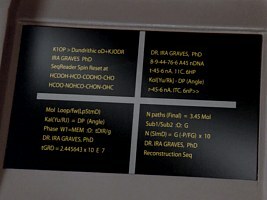 The new LCARS displays closely follow the lines of the original, yet the resolution is much higher (no pixelation visible), and they occasionally include some new in-jokes with names of the people involved in the remastering. 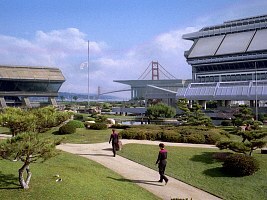 The season 4 Blu-ray set comes with several special features, such as "Homecoming" (which addresses the arc-based storytelling and the "family" episodes), "Prosperity" with newly produced interviews with the principal cast and "In Conversation: The Star Trek Art Department" with my personal heroes Herman Zimmerman, Rick Sternbach, Mike and Denise Okuda, Doug Drexler and Dan Curry. Also, there is a compilation of the deleted scenes from several episodes of the fourth season. In terms of image quality season 4 is at least on par with the generally praised season 3. CBS Digital has not only maintained the high standard but keeps improving it and has passed it on to the team of Modern VideoFilm. Like the two previous odd-numbered seasons, season 5 in its entirety was remastered by the team of CBS-Digital. About three minutes of footage (from "Power Play" and from "The First Duty") could not be located for the remastering process and were upconverted. The rest was remastered according to the very high standards that already governed the seasons 3 and 4. 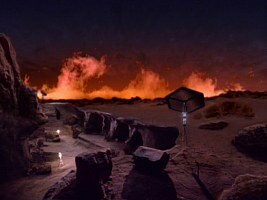 Some of the scenes with moderate to low illumination came across as just too dark in season 4. I didn't spot any such (small) issues in the dark scenes of season 5, such as in "Disaster", "Unification", "Hero Worship" or "Time's Arrow I". Once again, I am pleased above all with the brilliant colors. The color reproduction is on the same level as in season 4, with the bridge again being a bit more beige than I may have expected. An improvement is also visible in the scenes shot on location such as in "Darmok", "Silicon Avatar" and "The First Duty" (Starfleet Academy!). They were rather good already in the original episodes, but I just love the enhanced colors. The location shots in bright sunlight are now also rather noiseless compared to the ones with a good deal of artificial illumination, such as on the ship. I am glad that neither additional noise was added, nor noise reduction was applied to the shots with less light. I found no problem with the newly mixed 7.1 sound, once again with the explicit note that I don't have anything connected but simple TV speakers. Season 5 starts and ends with a two-part episode. The four other "big" installments are "Darmok", "Unification", "Cause and Effect" and "The Inner Light", fan favorites that can be found on every list of the best TNG episodes. 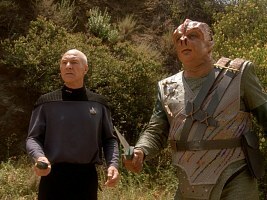 "Darmok" excels because of its message of mutual understanding and cooperation, the double feature "Unification" for Leonard Nimoy's return to Star Trek as Spock on a mission of peace, "Cause and Effect" because of its breathtaking sci-fi plot, "The Inner Light" for Picard's touching experience on a doomed alien world. In addition, "Disaster" and "Conundrum" made my personal list of favorite episodes, but there are just too many great stories in this season to mention them all in this condensed review. Several of them include an ethical or moral comment that applies in the 20th century just as well, such as "The Outcast" (sexual tolerance) or "The First Duty" (the truth should not be sacrificed to allegiance). There is a common motive in several episodes of season 5, which is why I refer to it as the "Season of the Children", but fortunately it never becomes too cutesy. Well, and among only three or four mediocre episodes there is one real stinker, "Silicon Avatar", which I hate for its twisted ethics and the idea to put the blame for the Crystalline Entity's inevitable destruction on a scapegoat. Please go to my extensive episode reviews to see what I think of the individual episodes. 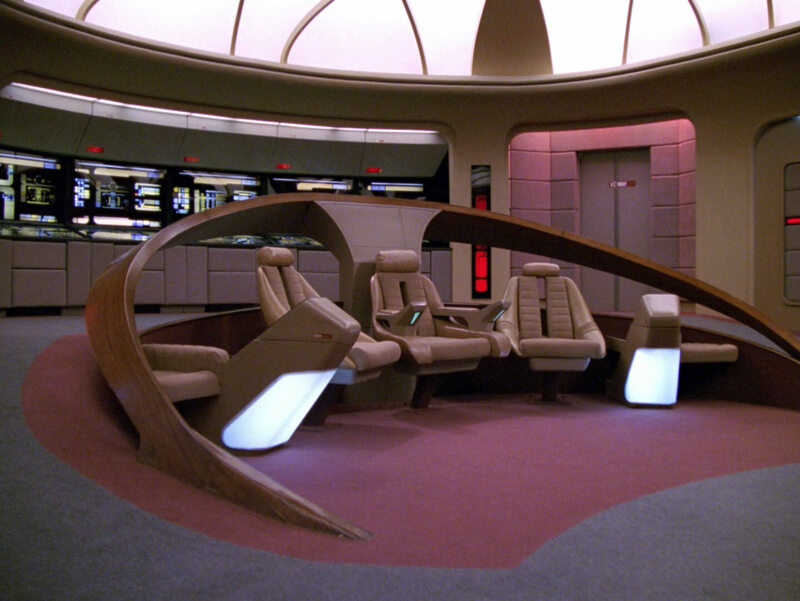 TNG Penthara IV: still dirty? 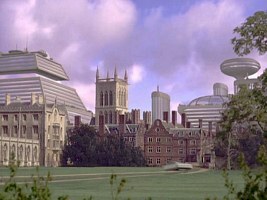 Season 5 has several new planets, of which my favorite is Penthara IV from "A Matter of Time". Matte paintings were generally only slightly retouched to make them HD ready, such as the biosphere in "The Masterpiece Society". A bit more was changed about the town of Ressik in "The Inner Light". Practically all of the original CG models had to be recreated from scratch, such as the Crystalline Entity from "Silicon Avatar" or the game from "The Game". It is no big surprise that in the remastered release the arguably biggest mistake (at least the most often criticized one) of the season was corrected. The phaser beam in TNG: "Darmok" now emerges from the dorsal phaser emitter and not from the torpedo bay any longer. 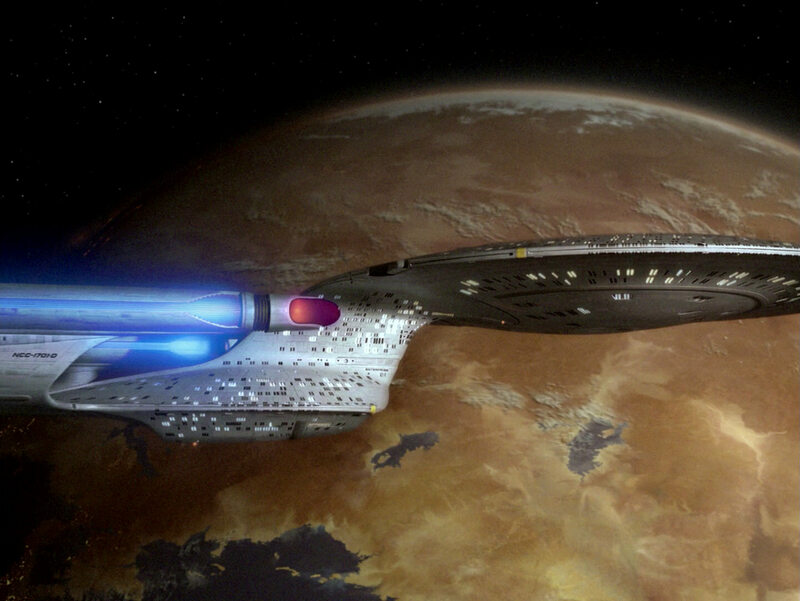 One more thing of note is that single shots of the Enterprise-D had to be replaced starting in season 4, and that season 5 consistently uses an improved CG model. Although the new CG model is based on the 6-foot model, as opposed to the physical 4-foot model it replaces most of the time, visual continuity is not impaired so much because of the added paneling that resembles the one of the 4-footer. Well, since already the original episodes often used both models in the same episode, it is no big deal anyway. But speaking of studio models, an obvious error at the end of "The Perfect Mate" was not corrected. We can still see how the footage of the Talarian observation craft magically changes to the one of the Talarian warship between two scenes. 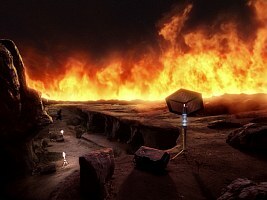 As already in season 4, practically all displays that were originally filmed up close as practical effects on the set were replaced for the remastered version of season 5. Especially in case of more extensive graphics and of CG animations the effects of the early 90s wouldn't have been fit for HD. 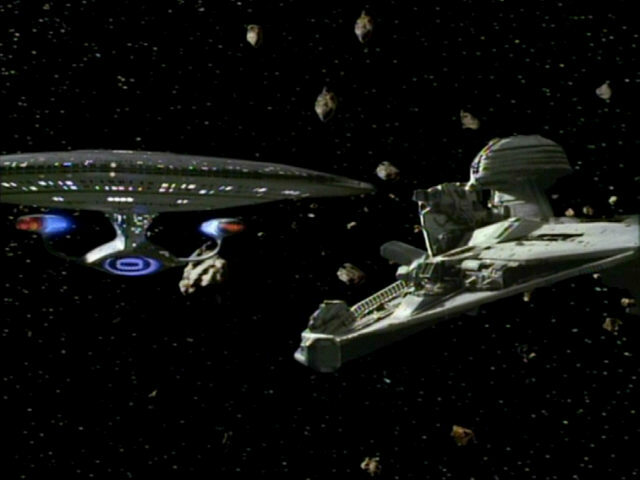 The most obvious example is the reconstructed Kolvoord Maneuver in "The First Duty". The set of six discs comes with several bonus features. There are deleted scenes from eight episodes, and four episodes with audio commentaries. In addition to the special features already included on the 2002 DVD set, there is a two-part documentation on Gene Roddenberry, who passed away on October 24, 1991, during the production of "Hero Worship". Another new documentation, "In Conversation: The Music of Star Trek: The Next Generation”, unites the regular composers Dennis McCarthy, Ron Jones and Jay Chattaway in front of the camera. Finally, the season 5 Blu-ray set also includes a gag reel. After seeing only a couple of episodes (and a few more in quick motion), it may be too early to label season 5 as the best remastered TNG release so far. In any case, it surpasses any of the four previous seasons in terms of its stories and will only be bettered by the sixth season in my view. 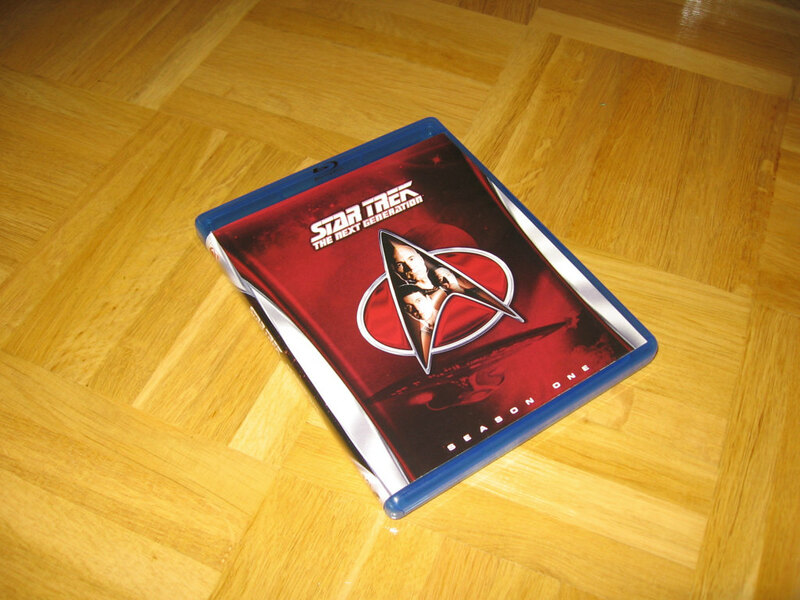 CBS-Digital has done a great job yet again, and although some fans may see a reason to complain about the SD footage or about the "compromise" CG Enterprise, I don't mind this very small shortcomings in a great Blu-ray set. If anything, I find it disappointing that the error with the wrong footage in "The Perfect Mate" was not taken care of. TNG's season 6 was remastered by the team of CBS-Digital. Unlike it was still the case in season 5, all footage could be found for the remastering process so no upscaling of SD material was necessary this time. 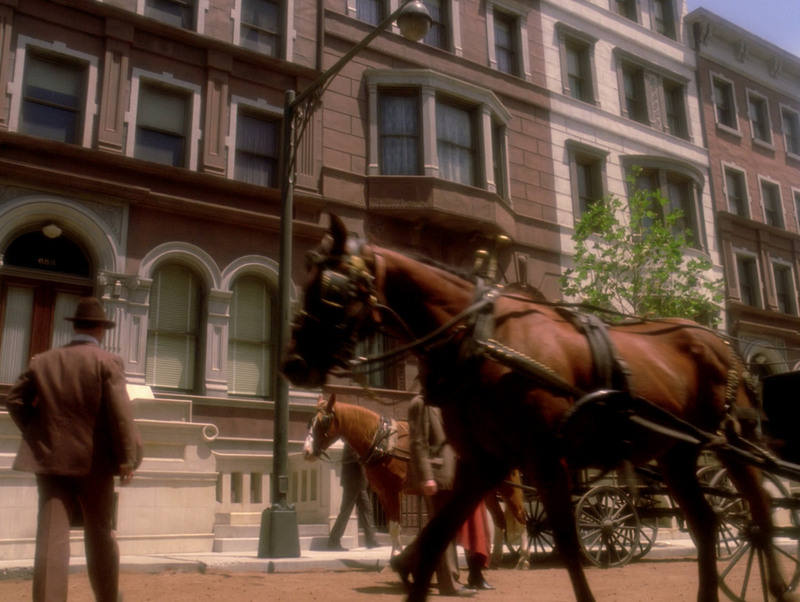 Overall, the picture quality of season 6 was softer in SD than in the three preceding seasons. I believe it is sometimes still visible in HD. There are scenes with overall fewer grain and/or noise visible, and even under perfect illumination conditions the quality is a bit less sharp than usual in TNG-R. While it doesn't really make a difference as I view the episodes the way I am supposed to (that is, on the HD TV screen), I think it is noticeable on the stills that I am working with. Like already in the two previous seasons, especially season 4, details in dark scenes are sometimes lost in black (or very dark gray). In other words, they fall victim to an overall contrast enhancement that was probably done to avoid the shots to become grayish. 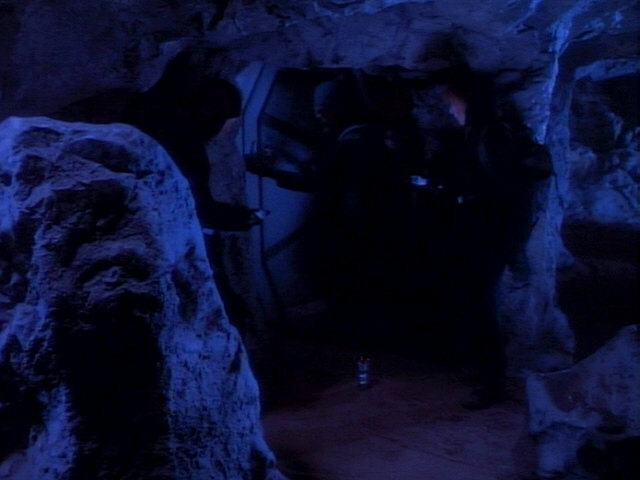 This can be noticed in the caves on Celtris III in "Chain of Command I" and to lesser extent in darkened crew quarters in a couple of episodes, but not in the caves in "Second Chances", for instance. In the dark scenes of "Chain of Command I" it is also a bit distracting that there is a fast succession of shots with little and with lots of noise. As in all previous remastered episodes of TNG, the colors are once again the aspect that was improved the most compared to the SD release. 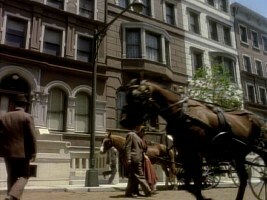 For instance, the previously pale location shots in the newly rebuilt New York Streets set in "Time's Arrow II" and in the holographic Western scenario in "A Fistful of Datas" are now bathed in warm sunlight. 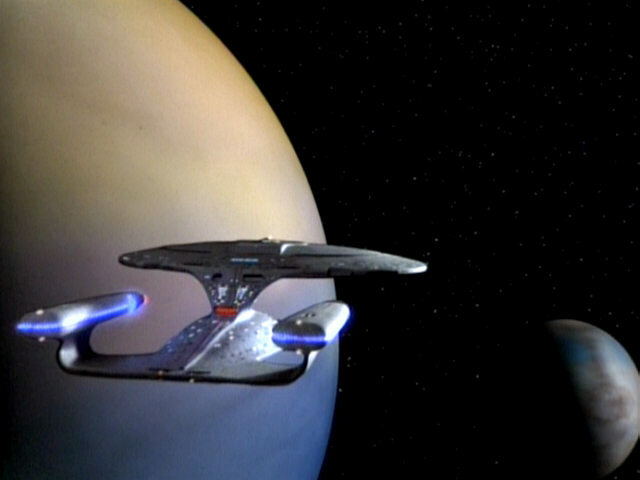 Conversely, the shots aboard the Enterprise used to appear too green/yellowish in the SD release of the season, which was corrected as well for TNG-R. I found no problem with the 7.1 sound of the Blu-ray box, once again with the explicit note that I don't have anything connected but simple TV speakers. 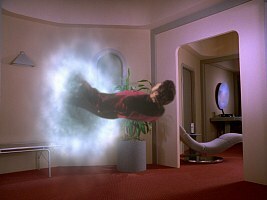 It is no secret that season 6 is my favorite TNG season. While TNG was running on TV, there was a continuous improvement in the stories of the series, in the way the characters were involved and also in the production values, a development that hit its peak in season 6 in my view. The first half of season is good but still far from perfect. It brings us two real highlights: Scotty's return in "Relics" and the dark thriller "Chain of Command I+II". "Ship in a Bottle" with its intelligently written cunning game and "Schisms" with its subtle horror are also among my favorites in this half-season. But there are also a couple of episodes that should have been done very differently, if at all. "Man of the People", "A Fistful of Datas" and "Aquiel" are bland and make it almost look like the writers were running out of ideas. 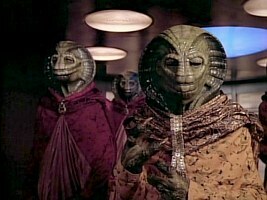 And the absurdity of a bunch of Ferengi taking over the ship in "Rascals" is hardly endurable. Well, after this mixed bag of stories the second half of the season reaches new heights. It includes "The Chase" and "Frame of Mind", two of my all-time favorite episodes, albeit for very different reasons. "Face of the Enemy", "Tapestry", "Starship Mine" and "Timescape" are further highlights. Actually, in this block of 12 episodes only "Lessons" fails to excite me. Please go to my extensive episode reviews to see what I think of the individual episodes. 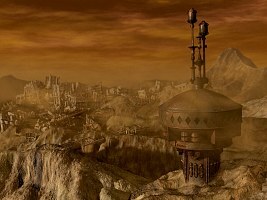 As in the previous seasons, most planets were newly created by Max Gabl for the remastered version. Besides the spectacular planet collision in "Ship in a Bottle", Indri VIII in "The Chase" is another favorite. Overall, the recreated planets of season 6 come with even more variety in textures and colors, wherever possible, than in previous episodes. 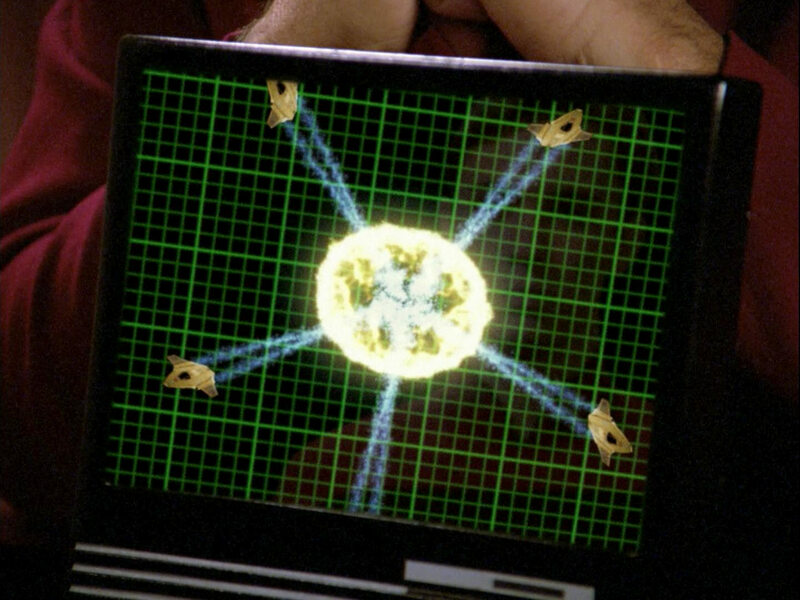 Unlike the planets, the matte painting of the inner surface of the Dyson sphere in TNG: "Relics" was obviously fit for HD. It remained unchanged and exhibits a great level of detail now that the film has been scanned in HD. The firestorms on Bersallis III, on the other hand, were reworked. 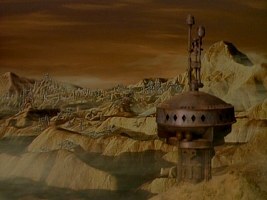 In the original episode, they were nicely integrated into the shot of the planet set for its time. Yet, the TNG-R episode significantly improves this shot by adding much brighter flames, and simulating how the fire illuminates the scene. Visual effects such as double exposures with additional light effects that originally had to be done on video tape used to look quite blurry in the DVD version. 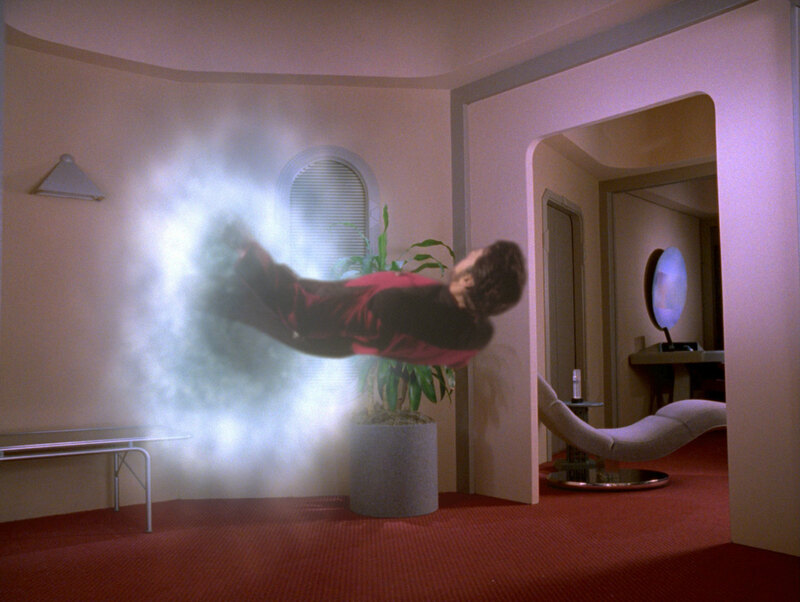 We can see a vast improvement of these effects in a couple of scenes, such as when Riker is abducted into subspace in "Schisms". Some small bloopers such as the the accidental on-camera appearance of TNG makeup artist June Abston Haymore in "Birthright I" were fixed for the Blu-ray release. But Bashir's famous tennis shoes are still visible in the same episode. The set consists of six discs with several bonus features. A couple of episodes come with audio commentaries: "Relics", "Tapestry" and "Frame of Mind". There is a new documentary named "Beyond the Five Year Mission – The Evolution of Star Trek: The Next Generation". There is also a gag reel, but once again the most interesting special features are the deleted scenes. I have seen only a few of the remastered episodes of the season so far, so I may still discover new aspects to consider. 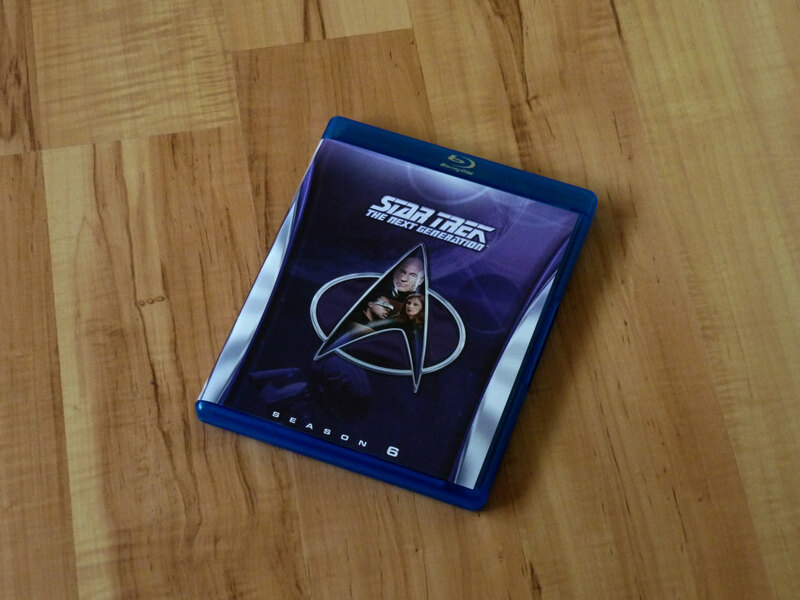 Anyway, it is my favorite TNG season, but also on the purely technical side the Blu-ray set of this season may be the best one so far. Even very critical fans who (unlike me) complain about small imperfections such as upscaled SD footage or not so perfect ship shots will find practically no fault with this season. Well, perhaps there is some room for improvement in dealing with very dark scenes. But especially the color reproduction, the incorporation of visual effects and the new planets have reached a level that is as close to perfection as possible. 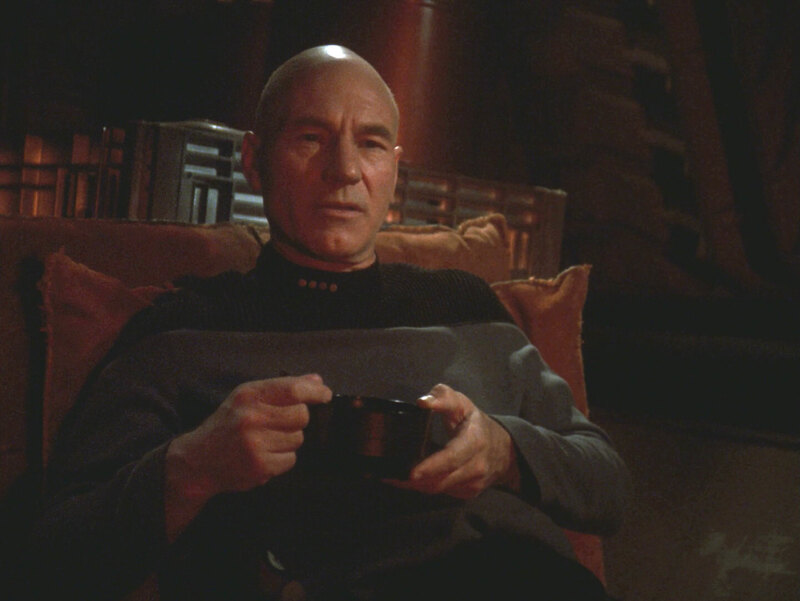 My impression is that TNG's season 7 had the best picture quality in terms of colors and contrast (but not necessarily sharpness) already in the TV/DVD version. So for its remastering there was not quite as much room for improvement as for the previous Blu-ray releases. Yet, the efforts of CBS Digital to restore the series also show in the season 7 Blu-ray set. The picture quality of the Blu-ray discs is superb once again, with a pleasant level of graininess and noise. Season 7 includes rather few dim scenes with inherently little contrast, like for instance inside the freighter wreck in "Liasons". I think even these problematic scenes have a nice balance between contrast and noise (although I have to adjust gamma or brightness individually to obtain usable screen caps). I experienced no problem with the 7.1 sound, at least not with my simple TV or computer speakers. The episodes of season 7 are a mixed bag. Some of them are simply badly done, such as "Sub Rosa" or "Masks". Others are noticeably hampered by the prospect that the series would come to a closure. I like how some story arcs are wrapped up near the end of the series. However, I don't think it was a good idea to introduce new family members of the crew in several episodes, as if the writers were working up a list of relatives to be shown. 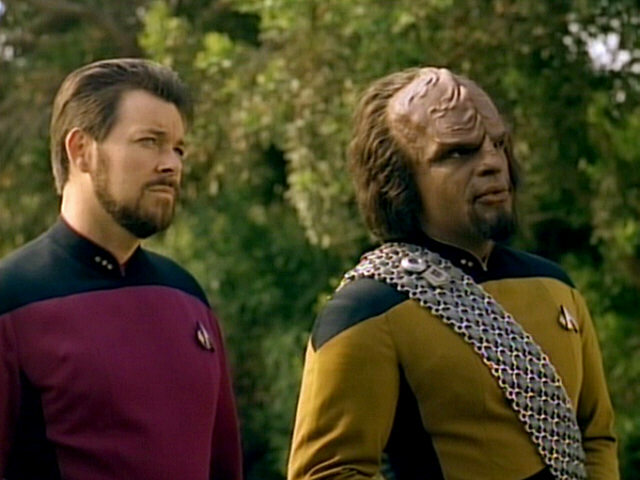 Likewise, bringing together Worf and Deanna looks like a desperate (and much too late) attempt to get things moving on the romantic side of character relationships. 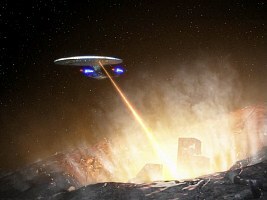 Moreover, I am not so happy that long-standing assets are falling apart: The warp drive is discovered to damage subspace ("Force of Nature"), the Federation has to turn against its own citizens, in the wake of which Wesley ("Journey's End") and Ro ("Preemptive Strike") leave Starfleet for good. On the other hand, we have highlights such as "Parallels" (perhaps my all-time favorite of all Trek series) and "All Good Things". Other episodes of note are "The Pegasus" and "Lower Decks", both with a somewhat dystopian undertone as well but still in the good old Star Trek spirit as it was prevalent in TNG. Please go to my extensive episode reviews to see my analyses and ratings of the individual episodes. It appears that most, if not all planets were newly created by Max Gabl, who once again kept the basic colors but added more structure and more variety. Digital alterations can also be found in a number of matte paitings. 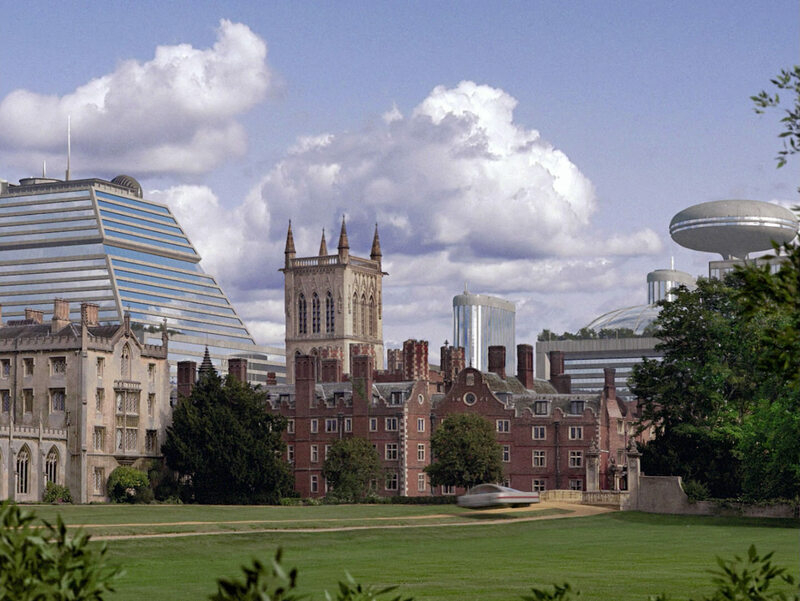 My favorite is the 24th century version of Cambridge from "All Good Things" that was carefully retouched with a more natural (and more pleasant) looking sky and with reflections of the clouds in windows, among other things. A few early CG effects had to be recreated from scratch, most notably the melting sequence of the comet in "Masks" that reveals the D'Arsay archive that was buried inside. The whole sequence was carefully reconstructed. The shiny surface of melting ice and the steam look better now, although I think that more could have done to make this look realistic. 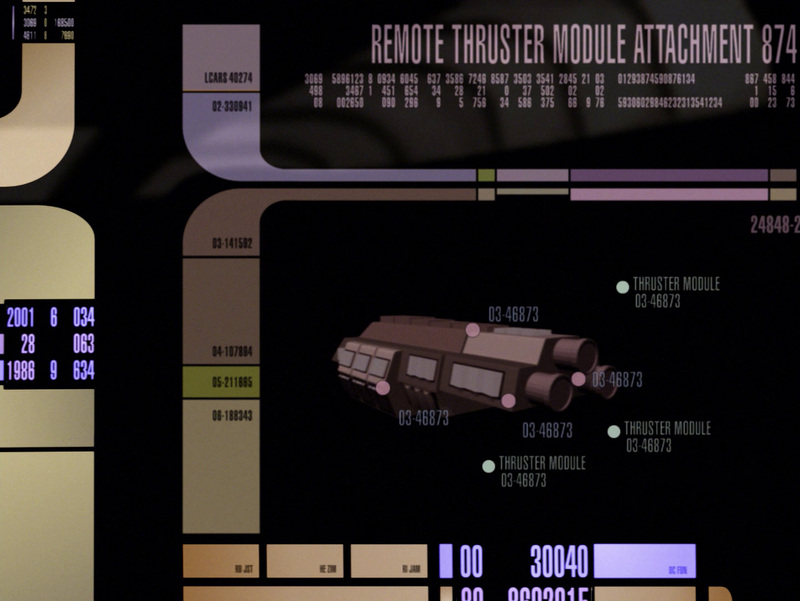 Also, the archive in the new CG sequence doesn't match the one that is visible on the Enterprise's viewscreen a few moments later. Other visual effects that were improved include the plasma eruption in the cave in "Attached", the storm in "Sub Rosa" and primordial Earth in "All Good Things". 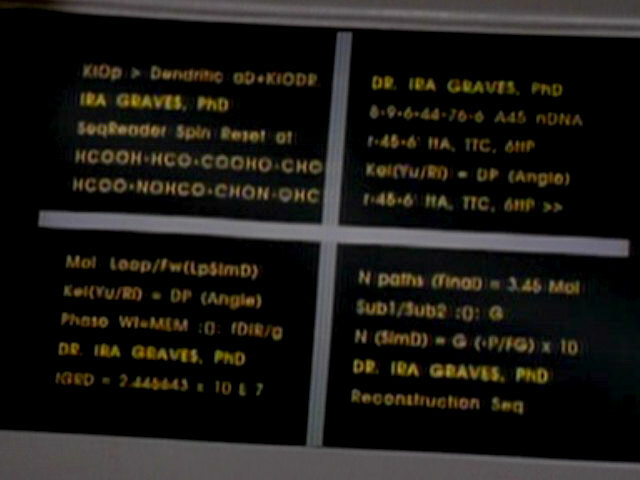 Some computer displays were modified as well. 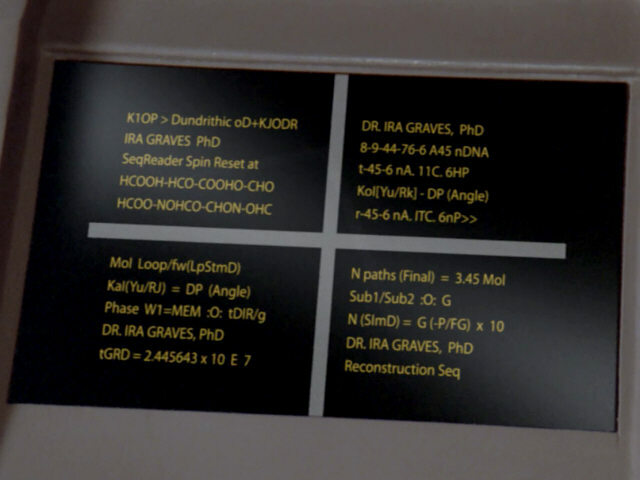 While the crew files in "Eye of the Beholder" still look the same (safe for subtle changes that I may not yet have spotted), the quickly scrolling crew manifest in "Inheritance" was newly composed, now including many names of the TNG and TNG-R staffs. The final TNG Blu-ray set includes the most comprehensive of the new documentaries by Roger Lay, Jr. and Robert Meyer Burnett, with the fitting title "The Sky's the Limit". In the first part, "Umbra", the producers and writers tell how the show came to life and how it was kept alive for seven successful seasons. The second part, "Penumbra", focuses on the unsung heroes behind the scenes, who were responsible for the look and feel of the series. In the third part, "Antumbra", the principal cast members and some guest stars share their memories of the show. This documentary celebrates TNG as a pinnacle of TV productions, and I think it has every right to do so. Other extras include a gag reel, deleted scenes from several episodes and the features from the 2002 DVD release. 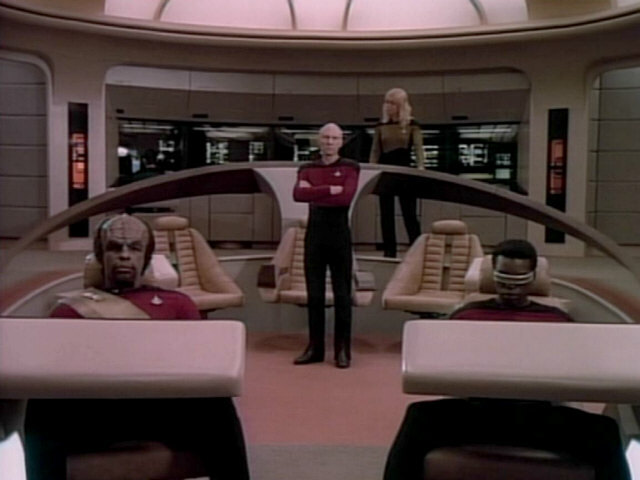 CBS Digital concludes the remastering of TNG with a nearly flawless Blu-ray set. Just as the production values of the original TV series have matured during the seven-year run of the series, the remastering process of the old footage has reached a consistently excellent quality level by now. 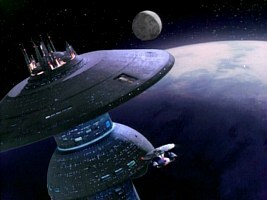 I hope that the experience gathered with TNG will not be lost but will go into the remastering of DS9.